ATV Winch Line | Synthetic Winch Rope | Superline 3/16"
The 3/16" Superline® Winch Line works best with winches ranging from 1,500 - 4,500 lbs. For more information on what length/diameter to choose please reference our Winch Line Guide. If your travels take you far off the beaten path, you need to be able to depend on your gear to perform. When it comes to winching, the Superline® Winch Line will not let you down. Made with pre-stretched and heat-treated SK75 synthetic rope, it is the most advanced synthetic winch line on the market. What makes the Superline® so super? Well first off, it’s pre-stretched and heat-treated construction gives it unparalleled strength. In the case of the 3/16” (5mm) Superline®, the breaking strength is 10,000 lbs - that’s 2,300 lbs stronger than our 1/4" (6mm) Classic winch line! Not only does this increase safety, but it allows you to install a smaller diameter line on your winch so you save space on the drum and the winch works more efficiently. The Superline® also has excellent abrasion resistance and is coated with a heavy duty polyurethane coating for UV and chemical resistance. Combine that with only the highest quality hardware and you have a winch line that is worthy of the toughest vehicle extractions. Despite all the benefits that the Superline® Winch Line has over steel wire rope, the proper precautions must be taken when using synthetic rope for winching. Synthetic winch lines are more prone to chafe damage than wire rope, so ensure that the winch rope is rigged properly and isn’t rubbing on rocks, trees or other abrasive surfaces while under tension. This is why we developed our removable Rock Guard to protect the rope when you can’t avoid contact with abrasive surfaces. With proper use and care, the Superline® Winch Line will last just as long, if not longer than a steel wire rope. For more information on maintenance, visit our Synthetic Rope Maintenance page. Click the button below to add the 5mm (3/16") Superline Winch Line - 10,000 lbs to your wish list. 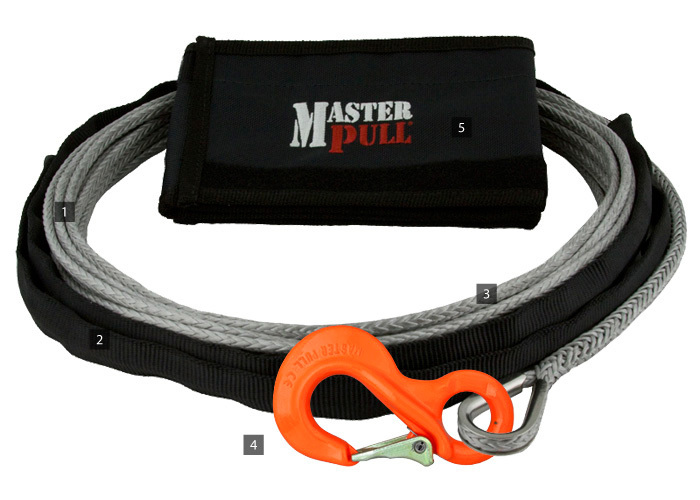 I bought a 50' Master Pull line about 10 years ago. My only regret was not getting 100'. After years of use and abuse I returned to Master Pull to order the 100' I looked at the competitors to see what had changed in the last 10 years but nobody beats Master Pulls price and given the past history with my first line there is no reason to go somewhere else and pay more.